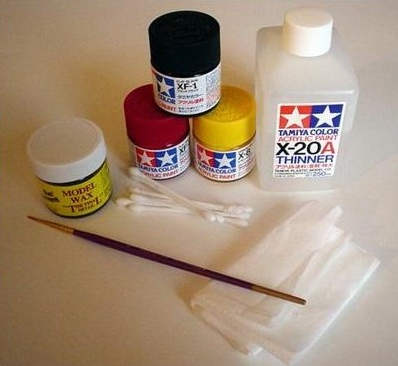 Different color flat acrylic paints (Tamiya is preferred, but other brands will work as well), acrylic thinner, q-tips, fine brush, Last Detail “The Treatment” model wax or Tamiya wax (or any other fine model wax), and cotton cloth. Before doing panel lines on your model, make sure the paint is completely dry, and even better if you already polished and waxed the body. 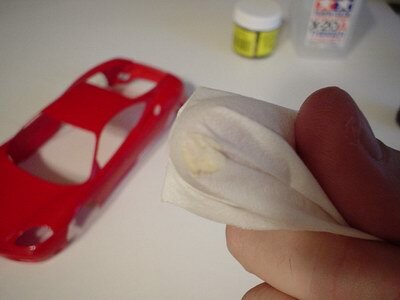 If you will be polishing and waxing it after doing panel lines, some of them will be clogged with polish and wax, and you may remove the paint from them while getting rid of polish residue. 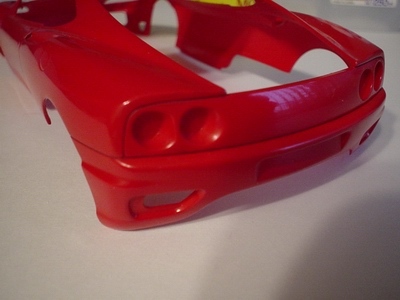 If car body has many decals that will be placed over panel lines, do panel lines before placing decals. 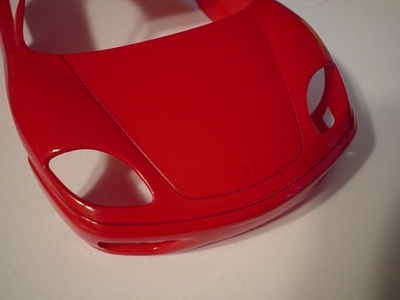 It will be very hard to remove excess paint from decals when filling panel lines with wash.
For panel lines to look more realistic, you have to choose the right color for your wash. Dark body colors (gray, gun metal, brown, etc) require black wash, red – dark maroon wash, yellow – mixture of dark yellow and orange, or yellow and brown, green – dark green, blue – dark blue, white – light gray, etc. Its impossible to give every color combination, but when you experiment with color mixing you will find the color that matches your paintjob. 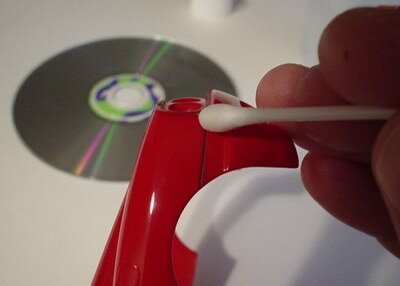 Next step – mixing a wash. Make sure everything is ready to apply the wash before mixing it. 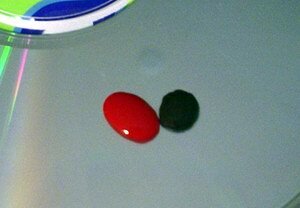 If you need to mix two or more colors to achieve required color, do this before adding any thinner. 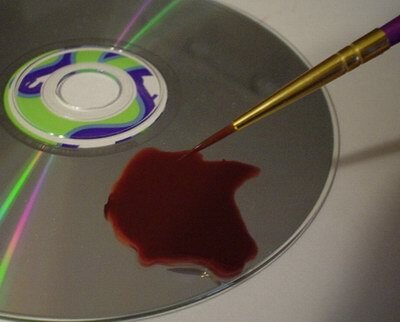 I use AOL CD’s for mixing purposes – works great and no need to clean up after all! 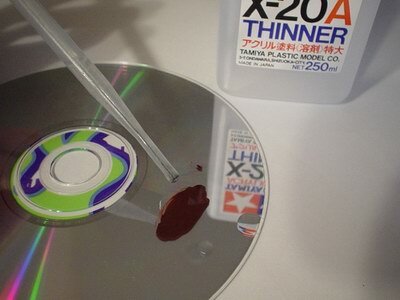 Put some paint on the CD and add thinner with the proportion of about 1:5. You wash must be almost thinner consistency. 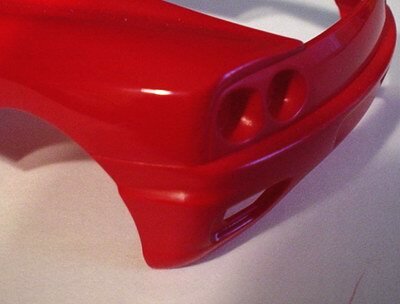 Add more paint/thinner to get the right mixture. Now you’re ready to apply the wash.
Make sure the panel line is free of debris or polish or wax residue before wash application. 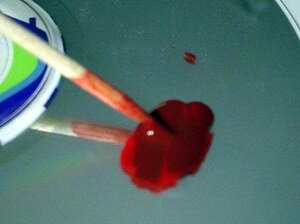 Dip the fine brush into the wash, but don’t dip entire brush – just ¾ of the bristle length. 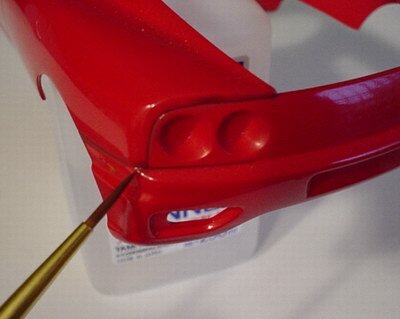 Touch the panel line in the beginning with the brush, and capillary action will draw some paint into the line. Dip brush in the wash again, and continue in the same fashion until all panel lines are filled with wash. Do not worry if some of the paint will get onto the panels – you can remove it later. Now its time to remove all unwanted paint from the panels. 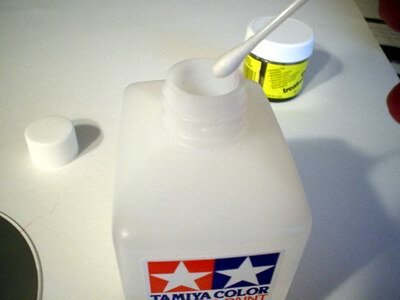 If the paint is not completely dry, you may use q-tip dipped into acrylic thinner and gently rub off the excess paint from the panels. 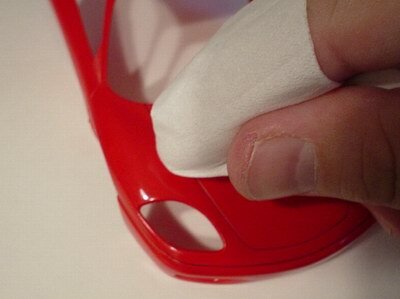 Make sure you do not press q-tip very hard, cause this will remove paint from the panel line as well and you will have to redo the whole thing. 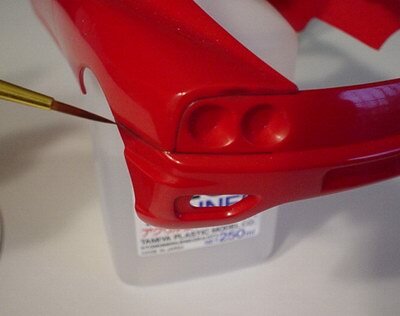 and gently rub the paint till wax removes it. 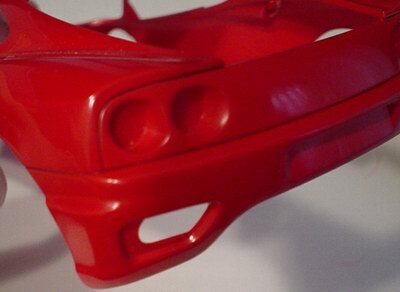 After removing all the paint, slightly wax the entire body to remove fingerprints and bring back the shine. 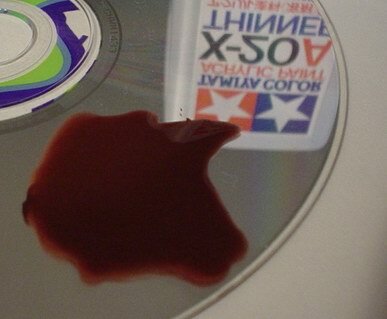 Copyright 2002 Alex Kustov. No copying or reproduction in any shape or form without written permission of the author.